Fear is a powerful emotion with clear protective functions. However, fear is not always adaptive. Did Elves Delay Road Construction in Iceland? 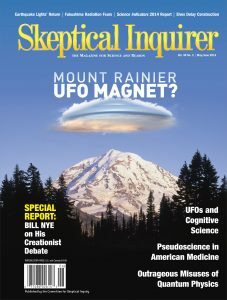 Mount Rainier isn’t just where seminal UFO figure Kenneth Arnold saw “flying saucers” in 1947; the majestic mountain actually plays a more direct role in saucerology. A study of federal funding advancing naturopathy, acupuncture, chiropractic, and energy healing as acceptable medical protocols finds troubling misuse of taxpayer dollars. The rational part of my mind recognized almost immediately thereafter that the identification I had come up with was nonsensical. But was it? Saucer, Saucer, Who’s Got the Saucer? A review of Intelligently Designed: How Creationists Built the Campaign against Evolution, by Edward Caudill.